During the autumn months in Rocky Mountain National Park, most of the aspen trees will turn a golden yellow during the fall season. 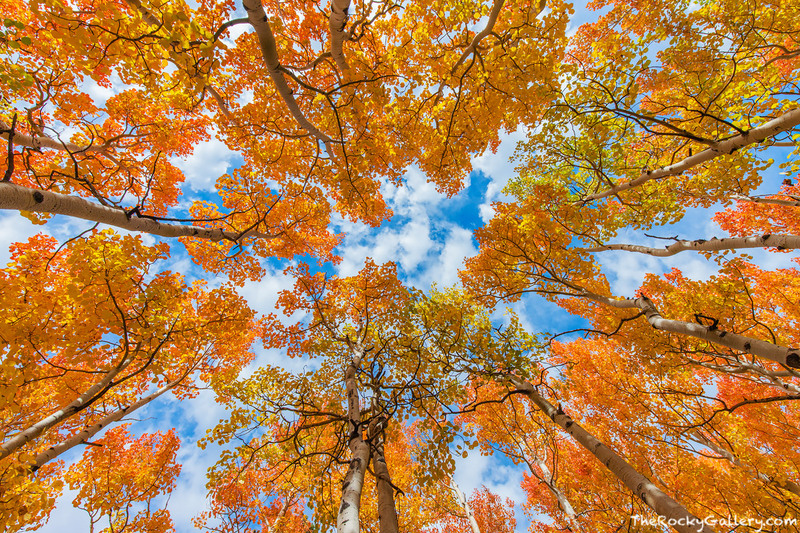 When conditions and temperatures vary slightly, some of these aspen groves will actually turn orange or red depending on the amount of moisture and temperatures. It's always a treat to find aspen's in Rocky Mountain National Park that have turned shades of orange or red as this bunch did near the Glacier Gorge Trailhead. This was a beautiful warm September day in RMNP, with Kodachrome skies and the smells and scents of autumn permeating trough the warm mountain air. Photo © copyright by Thomas Mangan.